House Judiciary Chairman Donald Lally has re-introduced the House version of the national popular vote bill in the General Assembly, joining the identical Senate version introduced by Majority Leader Daniel Connors. Visit FairVote RI's issue page for more info. 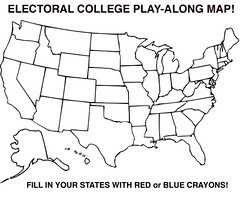 Click here to tell the General Assembly leaders you support a national popular vote for president. Under the National Popular Vote bill, all of the state’s electoral votes would be awarded to the presidential candidate who receives the most popular votes in all 50 states and the District of Columbia. The bill would take effect only when enacted, in identical form, by states possessing a majority of the electoral votes—that is, enough electoral votes to elect a President (270 of 538). In 2008, a shift of 1 million votes in seven states would have given the presidency to John McCain—despite Barack Obama’s massive 8 million popular vote margin. John Kerry could have similarly won in 2004 with a shift of 60,000 votes in Ohio despite a 3 million vote Bush lead. Last year Governor Carcieri vetoed the national popular vote bill after it was passed by both chambers. Perhaps after taking a look at the statistics from 2008, he will change his mind. During the general election season, presidential and vice presidential candidates visited similarly-sized New Hampshire for 12 public campaign events between September 5th and November 4th. They did not hold a single public event in Rhode Island, although then-Senator Joe Biden did visit for a $1,000 per ticket fundraiser. As Rhode Island’s concerns were being ignored, its businesses were also being hurt by an absence of the spending vibrant campaign operations bring. Between September 24th and November 4th, the major candidates spent $2,924,839 on television and radio ads targeted in New Hampshire—and $0 in Rhode Island. Despite a 5.7% increase over 2004, Rhode Island ranked 32nd in voter turnout in 2008, behind 13 of 15 battleground states. Rhode Island likewise ranked 37th in 2004. Small states like Rhode Island are almost all spectator states in the Presidential election. 98% of the 2008 campaign events involving a presidential or vice-presidential candidate occurred in just 15 closely divided “battleground” states. Over half (57%) of the events were in just four states (Ohio, Florida, Pennsylvania and Virginia). Similarly, 98% of ad spending took place in these 15 “battleground” states. This means that two thirds of the states, including Rhode Island, were ignored by the presidential campaigns. Nationwide, this lack of interest in “safe” states had a serious effect: turnout was an average of 6% higher in the “battleground” swing states.